Junior Golf Program focused on instruction, etiquette, and FUN! Walkable – Many of our members tell us the walker friendly feature was the single biggest reason they selected Sierra View Country Club. People today often include walking in their fitness program. If you walk Sierra View Country Club’s 18 holes, you can easily achieve over 10,000 steps. Research shows that walking a golf course can even lower your handicap. 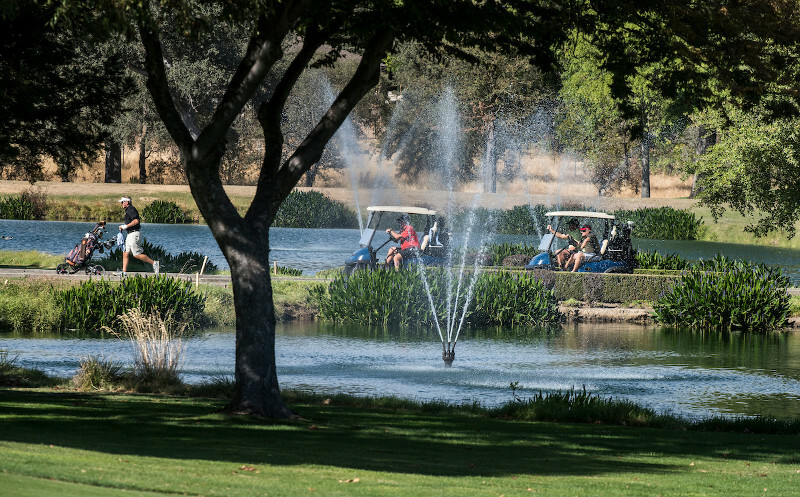 The majority of golfers at Sierra View walk the course, especially in favorable weather. Members and guests can also opt to ride in a cart. Evergreen Sierra View Country Club owns its own wells, so it has water independence. 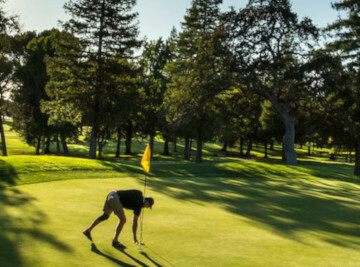 Regardless of what tricks the weather is playing on Northern California, Sierra View Country Club’s golf course will always be green. We are, however, good stewards of our water, and we do not overwater or unnecessarily water some areas. In the 2014 summer drought, we stopped watering the areas of the course that are not used by golfers. We turned off 125 unneeded sprinkler heads. But all of the fairways, rough, and greens remained watered and remarkably lush. Sierra View’s fairways are bermuda grass which is overseeded in the fall with rye grass. Greens are a mix of poa annua and bent grass. Respect for Pace of Play – Even though Sierra View is one of the most-played courses in three counties, enjoyed by golfers with a wide range of handicaps and abilities, walking or riding, Sierra View golfers are highly conscious of maintaining as close to a four hour round as possible. 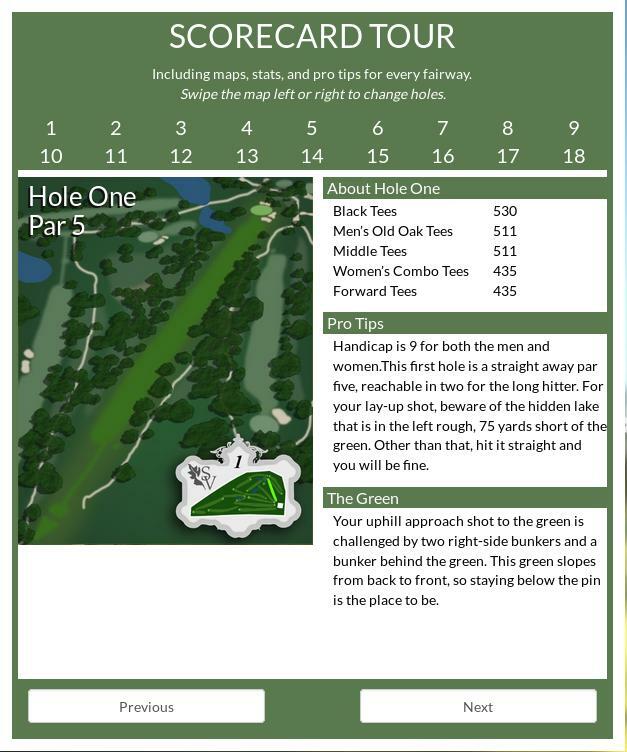 Men and women alike, young and not-so-young alike, all find pleasure in playing from the set of tees that fits their skill, and in always playing “ready golf.” With five possible tee selections, it’s a cinch for any member to find the tees that work for them. Sierra View wants to be known as the “fast play club”! Return to the Clubhouse – At Sierra View Country Club, when you have completed nine holes, you are back at the Clubhouse on the turn. That’s not true at every golf course in our area. So if you are only playing nine holes, you are just steps from the lounge or the dining room or the parking lot. Book Your Tee Times Online – Sierra View Country Club members reserve tee times online, view tournament lineups, email other members, check handicap stats, all through Fore Tees. Youngsters Bring A Friend for $5 – If you have under-age golfers in your family, they can invite a pal to play as long as the adult member plays too. Sierra View believes in golf for youth and supports young golfers in many ways. This is just one of those ways. Golf Tournaments – We host many Golf Tournaments from local events to national qualifiers, and Sierra View is an ideal venue for your next golf tournament. Jack Fleming, famed golf course architect, was commissioned to design Sierra View’s golf course in 1953. Other examples of Fleming’s course designs are: Sharon Heights Golf & Country Club in Menlo Park, Golden Gate Park Golf Course in San Francisco, Boulder Creek Golf Course in the Santa Cruz Mountains, Almaden Country Club in San Jose, and Dry Creek Ranch Golf Club in Galt. Over the past sixty+ years, such golfing greats as Byron Nelson, Natalie Gulbis, Nick Watney, Pat Hurst, and Billy Casper have walked the 18 holes of Sierra View Country Club. Famous celebrities have played here as well, including Ronald Reagan, John Brodie, Joe Montana, Steve Young and Steve Bono. ClickTouch here to Tour Our Course! Greens are well-bunkered. Water hazards are strategically located. 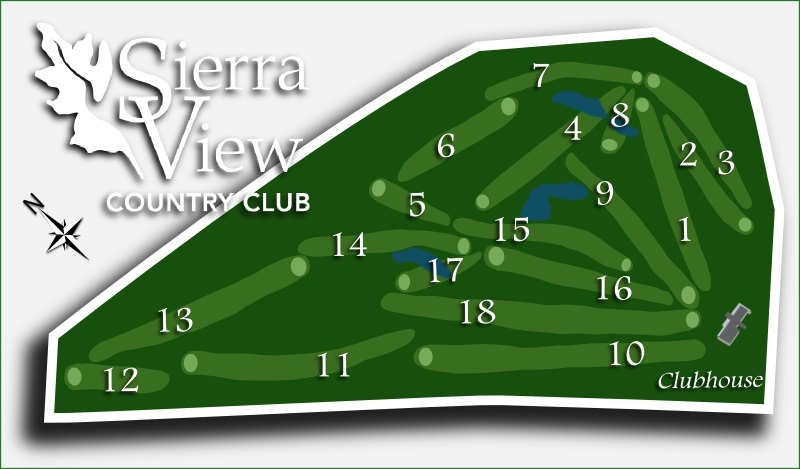 Hole 17 is Sierra View’s signature hole, a medium length par three over a majestic lake. The green is guarded by overhanging limbs of ancient valley oaks and a deep, big-faced bunker. Seventeen is a challenge for all levels of golfers, but it has given up many holes-in-one in spite of it! Look At All The Fun Golf Events You Could Enjoy! Flip through these events and imagine yourself having great times with great friends and neighbors at any of the tournaments Sierra View holds throughout the year. These are just some of them. Whether you are a social golfer or a competitive player, we encourage you to come play with us. The Betty Wade Senior Women’s Invitational Tournament was conceived by Betty Wade, a long-standing member of Sierra View. Twenty years ago, Betty approached the board and asked why the men had a senior invitational but not the women, and her request was honored. This is a one-day tournament for any member of the women’s golf group “sixty or better.” If you are “sixty or better” and want to be paired up with a Sierra View member for this May tournament, go to Contact Us and click on “Invite Me to Play.” We’ll pair you up for a day of amazing fun. Each year the theme is fun and sometimes wacky – check out this photo from the 2016 event. Yes, that’s an Elvis look-alike! The May Twilight Nine and Dine is typically themed around Cinco de Mayo. You’ll find golfers dressed in the colors of the culture, the food is always amazing Mexican cuisine, and the weather is amazing this time of the year. It’s a 5:30 shotgun, 9 holes of golf in a cart, followed by dinner and awards. All of the Twilight Nine and Dine events are open to guests. And they’re a great way of experiencing why people join Sierra View and stay and stay and stay. If you don’t know a member of the club but would like to be invited to this event or any of the guest events, go to the Contact Us page and select “Invite Me to Play” – we’ll fix you up with a member who will be your teammate for the evening. This annual tournament raises funds to support the families of our wounded warriors. It starts with an honor guard, a performance of the national anthem, followed by 18 holes of golf. The BBQ that follows is always a great one. This charity is just one of the causes supported by the men and women of Sierra View – a club with a heart. The tournament is open to the public, so keep an eye on our Facebook page to find out when it will happen again, always in late May around the Memorial Day weekend date. This tournament is possibly the highlight for the men of Sierra View and their outside guests. Three days of hilarity and competitive golf, amazing tee prizes, delicious food, and the support of gracious sponsors who help to make this annual event a real winner. If you would like to be invited to play in this or any of the guest events, please let us know. We can pair you up with a member who will be your teammate for the event. Go to Contact Us and select “Invite Me to Play” and we’ll get back to you. One of the most anticipated women’s golf tournaments. It takes place on a Saturday morning, and is open to all women golfers of Sierra View Country Club and their guests. Let us invite you to the next Mini Invitational! Use our Contact Us page to ask to be invited. You’ll have the best time ever! This tournament, like many others at Sierra View, is open to guests. If you know a member of Sierra View, ask to be invited. If you need to find a member to partner with, go to Contact Us and click on “Invite Me to Play.” You will make a bunch of new friends, guaranteed! This day offers members another way for parents to honor and promote their offspring’s interest in this fine sport, which teaches kids lessons they will carry into adulthood. It’s a one day tournament, and a tradition at Sierra View. Speaking of offspring, Sierra View has a membership plan for the adult children of members. Ask about the Generational Membership – it’s very popular and keeps families playing together through the years. Starting in April and ending in October, Sierra View puts on a twilight tournament once a month. Guests are encouraged to join members for these fun, always wacky 9 hole tournaments. In October we run out of daylight, so we switch to Glow Ball, played after dinner in the pitch dark! 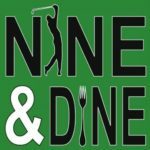 If you want to be invited to any of the Twilight Nine and Dine events, go to Contact Us and select “Invite Me To Play.” We will pair you up with a single member or a couple who are members. The cost is ridiculously reasonable, the golf is so fun (usually a scramble) and the food is delicious. 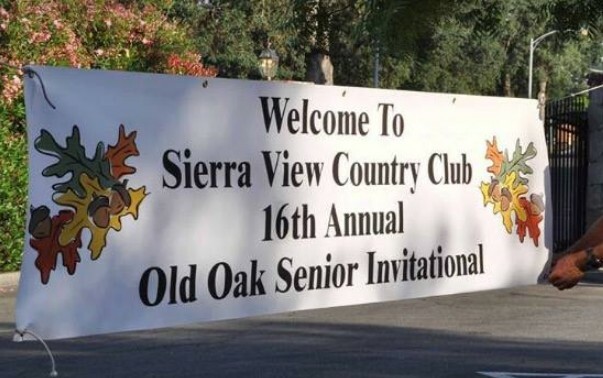 The Ladies Oak Leaf Invitational is the big event each fall for the Sierra View Women Golfers. Registrations for this popular two day event always fill up immediately. It starts with an optional 18 holes for members and guests on Tuesday, and finishes up on Thursday and Friday, ending with a raucous and tasty award lunch. Each year this tournament is held in honor of the current Captain, themed according to her special personality. Here are the 2017 winners of the Oak Leaf Invitational – two members and their guests. If you would like to be invited to any of the Sierra View invitational events, let us know. We’ll pair you up with a member who will be your teammate for the event. Go to Contact Us and select “Invite Me to Play.” This is a great way to experience fun times on the golf course at SVCC! If you haven’t played glow ball, you really need to try it. This twilight event starts with dinner, followed by nine holes played in the pitch dark. Each foursome is supplied with balls that glow – separate colors for each member of each foursome. Don’t expect to play well – these tricky balls don’t fly like regular balls. But you’ll get your money’s worth in belly laughs. The three day golf clinic is an annual event focused on skill building for adults. Note: Sierra View also puts on a similar event for youngsters, which is separate. We put on this clinic twice a year, once in March and again in November. The clinic is intentionally kept small – six participants is the average, which makes for very personalized attention from the pros. 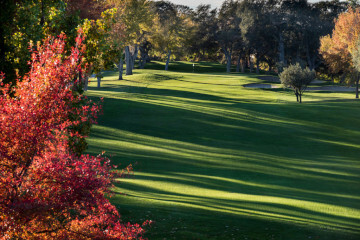 This is just one of the many benefits of membership in Sierra View Country Club. If working on your golf game is something you’d like to do, give us a call now. You could get in on the next clinic! Each day of the three-day clinic covers a major skill: Full Swing, Short Game, Putting.